An MTSU program that has improved the quality of life for numerous people and educated thousands of professionals recently marked its 50th anniversary in new quarters. The Speech-Language Pathology and Audiology Program hosted an open house from 2 to 4 p.m. Friday, Oct. 6, on the first floor of the Alumni Memorial Gym, home of the new Speech-Language-Hearing Clinic. MTSU President Sidney A. McPhee was joined by faculty and staff from the College of Behavioral and Health Sciences and the Department of Health and Human Performance, as well as supporters from throughout the campus, for a free public ribbon-cutting event followed by tours of the new space made possible by a grant from the Christy-Houston Foundation and major donors. The clinic’s new home has more than 1,000 more square feet than its previous quarters in the Boutwell Dramatic Arts Building, located two blocks east off Faulkinberry Boulevard. “The interesting thing now is that this is the only clinic I know of in Tennessee where undergraduates can work with people with communications disorders,” said Dr. David Arnold, who founded the program and nurtured it at MTSU for 39 1/2 years. Arnold, now a professor emeritus, began by screening education majors and minors for speech and hearing problems, working with the future teachers so that they could be understood by students. His wife, Janice, performed screening and therapy for students in the Rutherford County schools for 32 years. She worked as an MTSU adjunct professor in the summers of 1963 and 1964. “The only places (graduates) could work were in schools and a few clinics,” David Arnold said of the period before the birth of the MTSU program. Today, the Speech-Language Pathology and Audiology Program occupies a valued place in the Department of Health and Human Performance. Clients, who pay for services on a sliding scale, range from the very young to the very old. The clinic assists people with autism, Down syndrome, intellectual disabilities, articulation disorders, language disorders and, of course, hearing difficulties. The new clinic space features nine therapy rooms, three large observation booths, a student workroom and kitchenette, faculty and administrative offices and a new, top-flight audiology booth. Clinic Coordinator Elizabeth Smith, who graduated from the program in 1996, said the profession has grown tremendously over the years. “People are more aware of communication disorders and the responsibilities of speech-language pathologists and audiologists in diagnosing and treating these disorders,” Smith said. Dr. Rebecca Fischer, professor and coordinator of the Communication Disorders Program, thanked Arnold and other faculty for establishing the program years ago and for those who helped the clinic transition from the Department of Speech and Theatre to Health and Human Performance. “We have a great 50 years to look back on and we’re looking forward for the next 50 years,” she said. For more information about the MTSU program and clinic, contact Smith at 615-898- 2662 or elizabeth.smith@mtsu.edu. 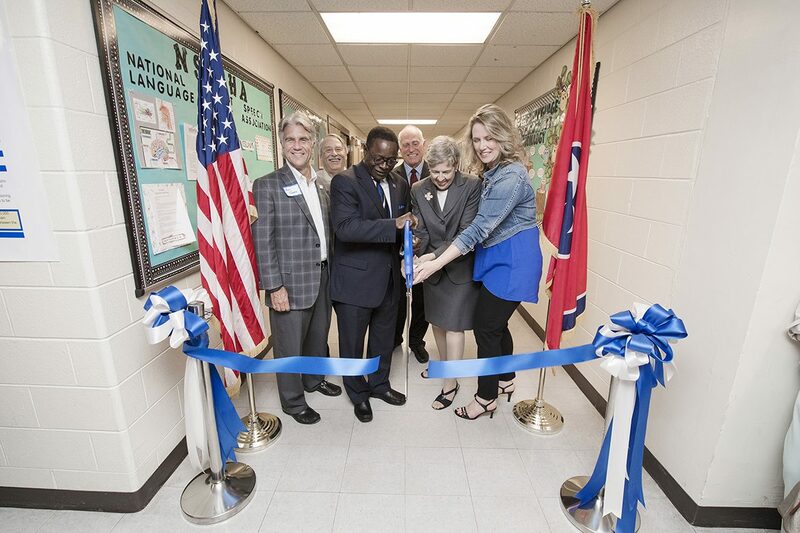 Officials are all smiles during the ribbon-cutting ceremony Friday, Oct. 6, for the new location of the the Speech-Language-Hearing Clinic inside Alumni Memorial Gym at MTSU.